Wine cellars offer creative solutions in storing varied bottles people treasure. Yet, more recently, wine cellars have served as intimate spaces for gathering and entertaining. 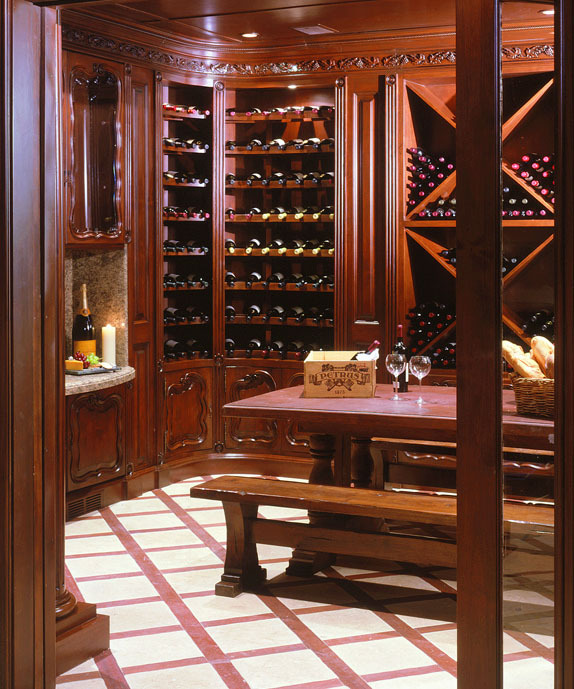 With the traditional of old world craftsmanship, Keystone Cabinetry has evolved a fine art of creating decadent wine cellars eager to entertain refined guests. This particular creation was specifically designed for a fashion designer’s tastes and personal need to create a warm entertainment room for dining guests. With this in mind, “Guess” brand owner, Paul Marciano commissioned this wine cellar to match his decadent needs of his luxurious home. Honduran mahogany was used to create storage for 10,000 wine bottles with a welcoming tasting area. Like Keystone Cabinetry on Facebook! Keystone Cabinetry on Los Angeles Home and Decor Magazine!